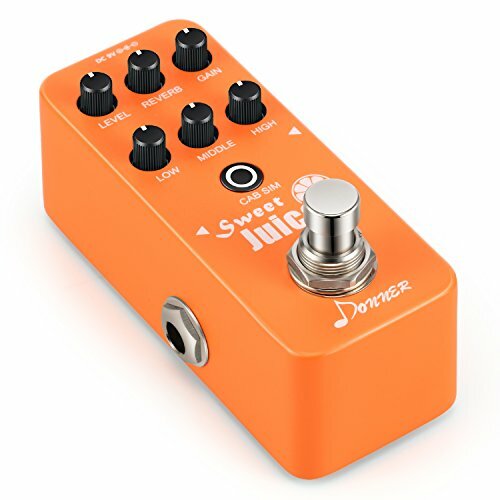 The NEW digital mini preamp pedal from Donner Company with the name of Sweet Juice, which is also a digital circuit pedal. A very good preamp pedal in the whole Aluminium-alloy stomp box. This is a wonderful pedal. Sound based on Fender 65 Twin Reverb* and Orange AD30*. Versatile 2-channel mini preamp pedal with organic tube amp sound. There are seven function knobs, namely LEVEL, REVERB, GAIN, LOW, MIDDLE, HIGH and CAB SIM. LEVEL is used to controls the effect output. GAIN is used to control the reverb amount. GAIN is used to control the effect gain amount. LOW/MIDDLE/HIGH is 3-band EQ for tone shaping. CAB SIM: Press: switches cab simulator on/off (the LED will keep flashing while the cab simulator is on); Hold: switch between two different channels: CH A(Clean, green LED) - Based on Fender 65 Twin Reverb*, CH B(Crunch, red LED) - Based on Orange AD30*. Sound based on Fender 65 Twin Reverb* and Orange AD30*. CH A(Clean, green LED) - Based on Fender 65 Twin Reverb*, CH B(Crunch, red LED) - Based on Orange AD30*. DC 9V adapter power supply(Center negative), NOTE: current consumption:200mA.Power Adapter is not included.